This article explains the A3 thinking in a practical way. After reading you will understand the basics of this powerful problem solving tool. In this article you can also download a free A3 template. Most organizations are perfectly capable of solving problems. However, realizing a structured problem solving approach is often much more difficult. Car giant Toyota has included the ability to continuously carry out improvements in operational performance in a structured process. This is called the A3 Lean Thinking Process. Toyota describes problem identifications in a 10 step plan in which cooperation and personal development of employees is promoted. Both the results of the problem identification and the planning are represented in a concise A3 report. The name of the A3 Thinking Process is derived from this paper format. Problems within an organization are often addressed superficially. The deeper, underlying causes of the problem are not always considered, allowing repetition to lie in wait. The same problems will resurface with the result that operational performance does not improve. The A3 Thinking process helps to arrive at a joint and detailed problem resolution. Underlying causes are thus eliminated. The problems is recognized, acknowledged and identified by the team members of the A3 Thinking process. Example: Structural late deliveries to customers. The problem can only be addressed by understanding the current situation. Toyota indicates that it is important to determine the extent of the problem. Example: What percentage of the deliveries are late? By drawing up countermeasures a new target will be formulated. The A3 Thinking team will specifically describe the expected improvements. Example: Because of the new form of communication, the status of the delivery will be clear to the customer and the company. By finding out the causes of the problems, measures can be taken. The main causes are identified by the so-called ‘why’ questions via a Root Cause Analysis. Example: Why are deliveries late? Why this percentage? Why are customers not informed? The underlying causes can be properly addressed by using countermeasures. As a result of this, structural changes are made in the work processes and the work will become more efficient once more. The A3 Thinking process team can work purposefully by pointing out the contents and the details of the countermeasures. Example: the analysis in Step 2 has appointed ‘Poor communication to customers’ as the main cause. A countermeasure could be that Stock Control maintains contacts with both the suppliers and the customers on a daily basis. To achieve the goal, a carefully thought-out and workable implementation plan will be drawn up. This execution plan consists of an action list, responsible participants and has a time limit. Expenses and resources can also be included. Example: The number of complaints must be decreased by 70% within three months. The follow-up plan checks whether the changes and adjustments will actually yield the best results. The follow up plan enables the correct and proper execution of the implementation plan. Example: by carrying out spot checks, it will become clear whether the deliveries have improved. It is of vital importance to discuss the plans with all the affected parties. Without a consensus, the plan is doomed to fail. By discussing the advantages and disadvantages of the plan with several parties, the plans can still be refined. The A3 LEAN thinking process team must obtain approval from an authority within the organization. This could also be the team leader. Without a final implementation there can be no (radical) change. Through regular meetings, the A3 LEAN thinking process team can map out the steps of the execution, tasks, actions and deadlines. Only by means of evaluation it is impossible to determine whether the final results have been achieved. When there are deviating results, it is important to find out what could have caused these deviations. Subsequently, changes and/or adaptations will have to take place in the process, so that the goal will still be achieved. Based on the evaluation, another problem can be identified, as a result of which the whole cycle of the A3 Thinking Process begins again. Steps 0 up to 6 will be included in the A3 report. By documenting this part of the A3 Thinking Process, the people involved will have a better understanding of the working method and the problem analysis and problem resolution will have more structure. 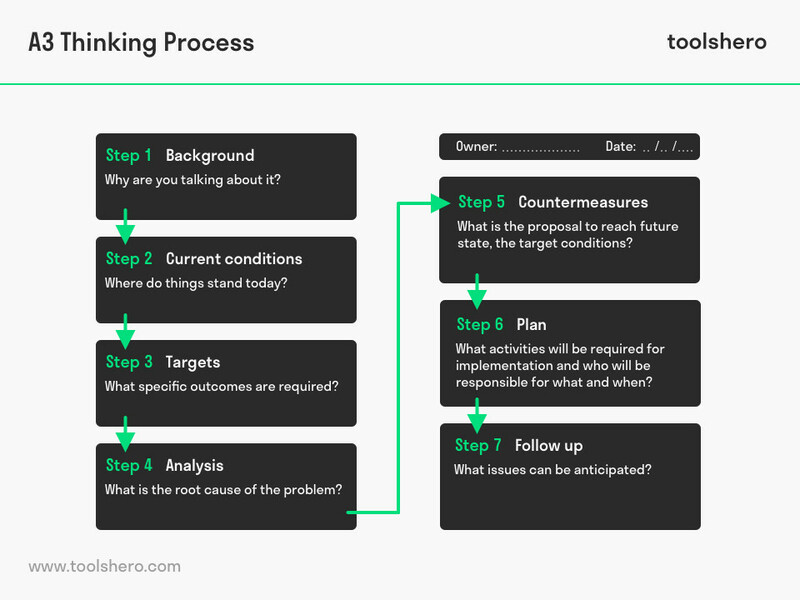 Download the free A3 Thinking Process template. This template is available for free as an editable Word file or as a printable PDF. What do you think? Is A3 Thinking Process applicable in today’s modern businesses and organizations? What is your experience using the A3 Thinking process? What are your success criteria for a good A3 Thinking process? Liker, J., & Convis, G. L. (2011). The Toyota Way to Lean Leadership: Achieving and Sustaining Excellence through Leadership Development. McGraw-Hill. Shook, J., & Womack, J. (2008). Managing to Learn: Using the A3 Management Process to Solve Problems, Gain Agreement, Mentor and Lead. Lean Enterprises Inst Inc.
Sobek II, D. K., & Smalley, A. (2008). Understanding A3 Thinking: A Critical Component of Toyota’s PDCA Management System. Productivity Press. What is the amazing tool!